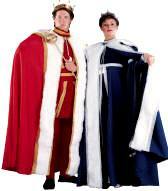 royal tunic will make you say NI! 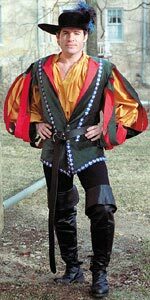 Includes: Soft 100% cotton tunic accented with the coat-of-arms on the front, attached faux golden polyester chain mail sleeves, collar sewn in & matching medieval knightly belt . A hidden zipper in the back allows for easy on-and-off. See helmet below, available separately. a tree with a herring. Lightweight, soft polyurethane and is painted to have an antique steel finish. 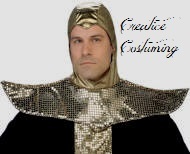 The crown is real polished brass with a lightweight brass comail (chain mail skirting) attached. 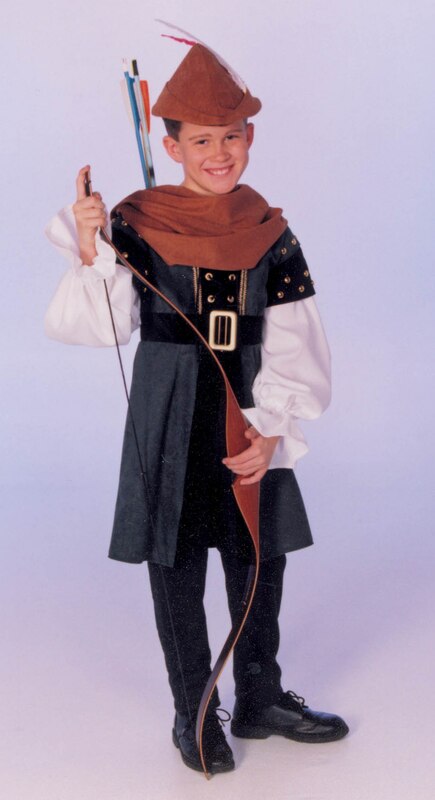 in style in this great Sir Robin costume! 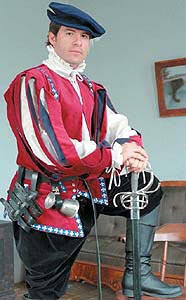 & matching medieval knightly belt. A hidden zipper in the back allows for easy on-and-off. 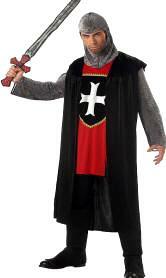 You will be able to seek the Holy Grail and Castle Anthrax in this glorious Sir Galahad costume! the validity of a witch! may turn you into a newt! Made of a lightweight, soft polyurethane, it has been painted to resemble darkened, blued steel. The front has a movable visor, while the real brass finial on the top holds a truly silly plume in place. 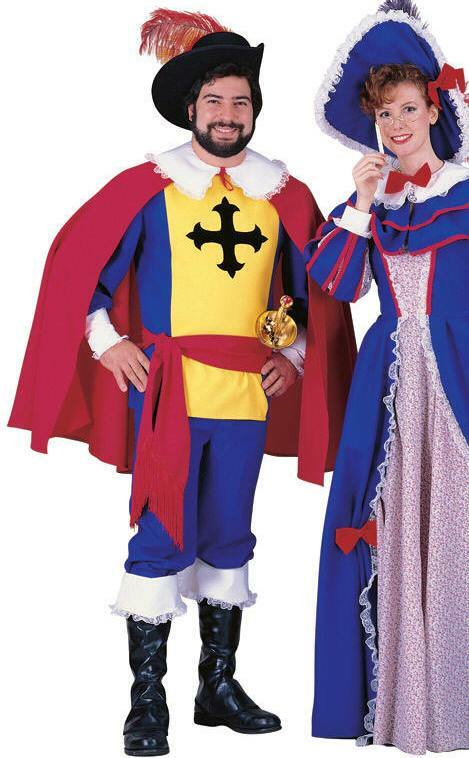 You shall make other knights look like pansies when you wear this daunting ensemble! 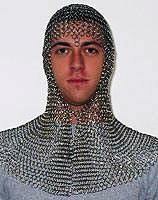 None shall be able to pass up this imposing helmet! Helmet is made of lightweight, soft polyurethane and painted with a darkened, antique steel finish. 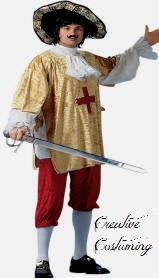 Unless your mother was a hamster and your father smelt of elderberries, you will be needing this costume for all of your taunting pleasures! 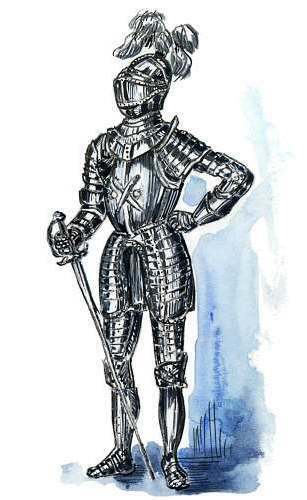 Includes: The gambeson of this French Taunter costume has an armored look, short sleeves and countless silver studs, attached Faux steel chain mail sleeves, faux steel chain mail coif, the sides dual buckles allow for easy on-and-off. 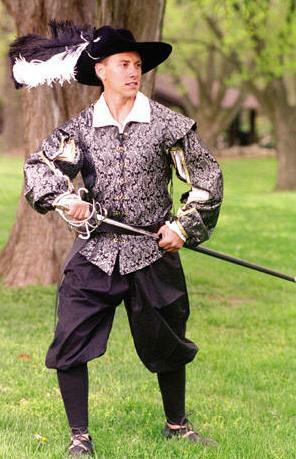 This is the perfect pair of armor for taunting those silly English khaaaa-nigggets! 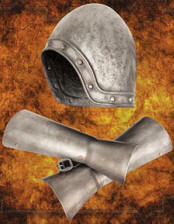 The helmet is made of lightweight, soft polyurethane & painted to resemble antique steel, while the two vambraces are vacu-formed plastic with real leather straps & painted to match. Includes: Regal tapestry robe accented w/gold metallic trim & black faux fur, gold jacquard tunic & black velvet hat accented w/jewels & feather. 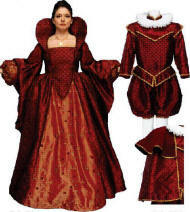 Includes: Elegant dress accented w/gold metallic trim, matching belt, collar & 2 muffs. 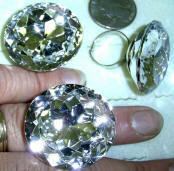 T7713 not available for purchase. Plus Size 14-22 T7641 rental available see below.  Same as Above in Blue. 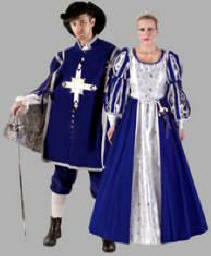 Color: Royal Blue (above), Black (above). Back bodice is elastic shirred for comfort & to accommodate a variety of bust & waist sizes. Sz L & 2XL available for purchase. Sz S available for purchase. 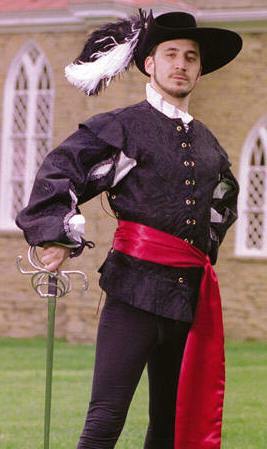 metallic trim, matching sword sash, satin pantaloons & cuffed vinyl boot tops. 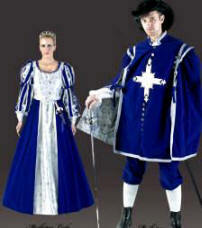 Includes: Blue Tunic with attached shirt and cape, all accented with silver trim. 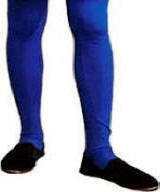 Includes: Blue Tunic with attached shirt, pants & cape, all accented with silver trim. 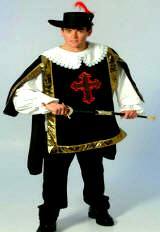 Black & Gold Tunic, attached shirt & Cape. 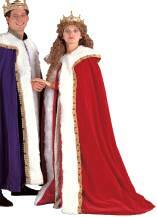 Includes: Red Tunic with attached shirt and cape, all accented with Gold trim. 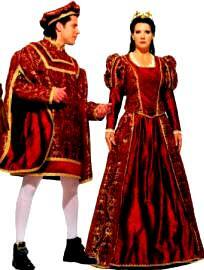 Includes: Red Tunic with attached shirt, pants and cape, accented with Gold trim. Excellent for & very flattering on larger woman. For similar see Colonial page. standing collar & back zipper. 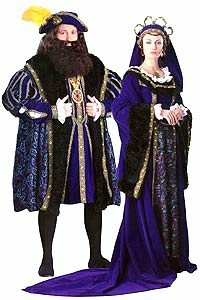 Includes: Under tunic in purple velvet w/heavy gold embroidery, surcoat in metallic brocade trimmed in gold braid & faux (simulated) mink fur. Matching velvet hat & feather plume with everything heavily accented with gold jeweled trim. 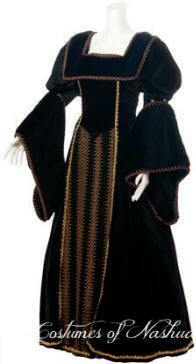 Includes: Sparkle brocade tunic with long flowing draped sleeves trimmed with matching braid, faux (imitation) mink fur and matching period style hat. 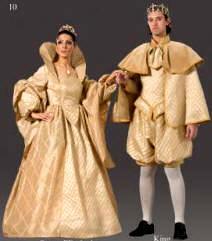 Includes: Loose fitting velvet tunic with white sleeves & velvet strips accented with gold metallic trim, white ruffle at neck, gold trim at yoke & hem, full Velvet Cape with white fur trim, rope belt & socks finish this royal costume. 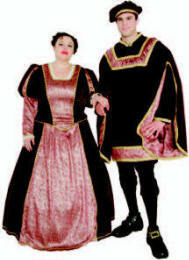 Includes: Full length Faux Velvet Tunic and Robe accented with gold lame & gold metallic trim, gold rope belt & crown. Just like the one seen on TV. 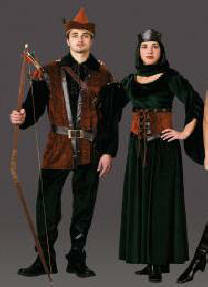 Includes: Black Tunic accented with metallic gold trim & sleeves, attached black cape with red satin lining, gold cowl & belt. 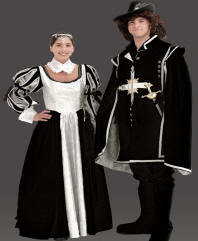 Includes: Tunic with attached cape, gold cowl & black velvet sleeves. 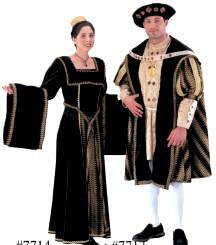 Includes: Tunic with attached cape, gold cowl, pants and black velvet sleeves. 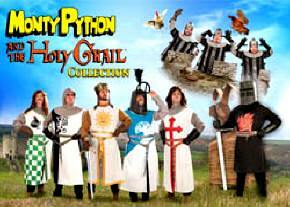 Includes: Long Tunic, Hooded Cowl & Belt. & belt all accented with gold trim. lined cape, sleeves, cowl & belt. lined cape, sleeves, pants, cowl & belt. lined cape, cowl & belt. lined cape, pants, cowl & belt. hooded cowl, pants & belt. Includes: Blue/Yellow long tunic w/ front & side slits, Gold Cowl & belt. Includes: Metallic mesh undertunic tunic & pants, brocade overtunic with crest, gloves with matching gauntlets & matching metallic mesh hood. 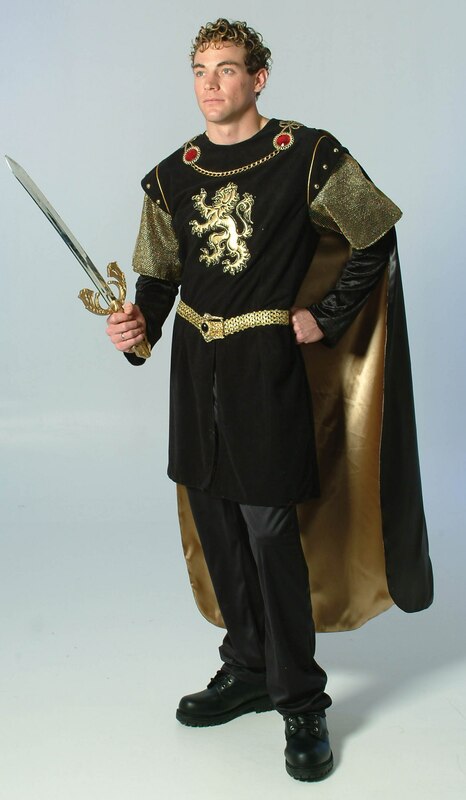 Includes: Tunic w/embroidered lion crest, lined metallic mesh sleeves, undertunic & hood, shoulder guards, black knit pants, arm guards & belt. 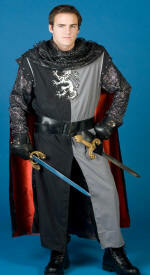 Includes: Panne velvet overvest, ivory faux leather tunic with silver metallic lame sleeves and matching cowl headpiece. 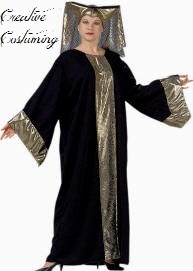 Includes: Metallic Tunic w/mesh metallic sleeves, gold embroidery, pants, boot tops & belt. 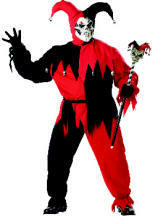 Includes: Poly & Lurex top with screen print hood, gauntlets, boot covers & belt. 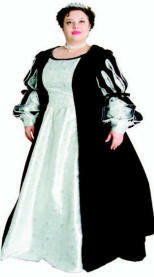 Includes: Tunic with attached cape, hood & boot tops. Includes: Lace up jacket w/gold trim, gold studs at shoulders, & attached shirt, pants & belt. 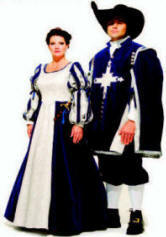 Includes: Blue Velvet jacket w/gold trim, gold studs at shoulders, attached shirt & cape w/emblem. 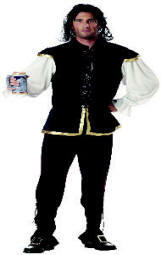 Includes: Blue Velvet jacket w/gold trim, gold studs at shoulders & attached shirt, cape & pants. 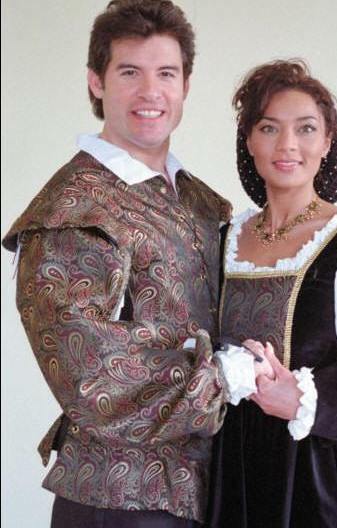 Includes: Lace up Tunic accented w/gold metallic mesh & trim, attached shirt & burgundy hat w/feather plume. 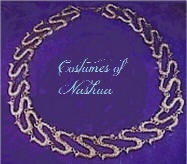 Includes: Lace up tunic w/gold trim, attached shirt & belt, pants & jeweled hat w/feather. 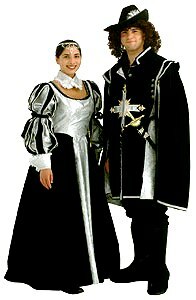 Includes: Pleated velvet tunic trimmed with silver metallic braid, puff sleeves, ruffled collar & cuffs, and matching velvet hat. 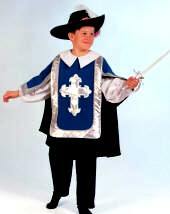 Includes: Tunic w/attached cape & matching hat. Includes: Jacket, pants, boot covers & hat. XXL T7715XXL.625.55 available as rental only. gaiters (boot covers) & epaulets. 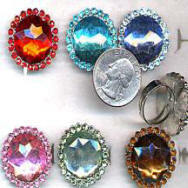 Hat A13158.561.55 available separately @ $39.99. 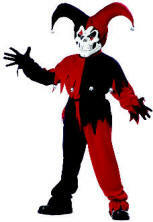 Includes: Military style jacket w/attached vest, pants, boot tops & hat. Discontinued but available for rental. 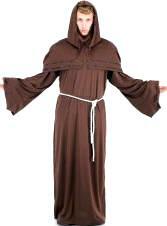 Includes: Brown suede cloth gown & hood, Rough cotton Tunic w/brown trim & rope belt. Includes: Tunic, pants, cowl, hat with feather. Includes: Dress accented w/cable rope piping, lace up corset belt w/eyelets, cowl & crown. 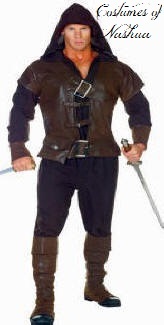 Includes: Vest trimmed in leatherette, full sleeved shirt, pants, belt, arm and leg gauntlets. Includes: Brown & Black Cordovan leather tunic/vest accented with studded black trim and center front & center back laced closure, shirt & black side lace up pants w/elastic waist. XL C: 48" / W: Pants available to fit all sizes. 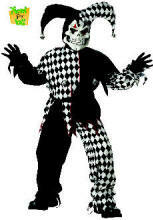 2XL C: 50-52" / W: Pants available to fit all sizes. Includes: Black leatherette and faux wool tunic accented w/shawl collar, cap sleeves, silver stud trim, center front laced detail, shirt & black side lace up pants w/elastic waist. 2XL C: 56-58" / W: Pants available to fit all sizes. Looking for something unique and attention grabbing? This is it! 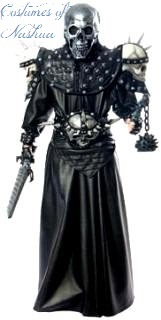 Includes: Faux Leather Robe, embossed faux leather cumberbund, heavy durable latex shoulders amour with matching spiked skulls on each side, latex mask, matching latex belt, heavily decorated leather gauntlets, plastic swords and latex mace. Armour laces up the front with black cording, shoulders are supported by foam blocks. 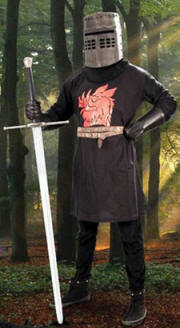 Includes: Hooded vest with attached sleeves, belt with attached pouch, sword belt and boot covers. 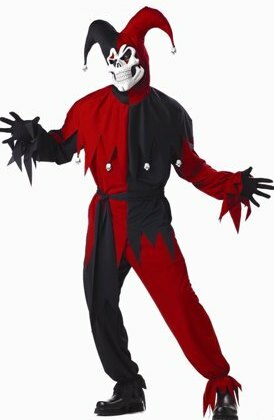 Includes: Grey Suede cloth vest accented w/short sleeves, V neck, side vents, shirt & black side lace up pants w/elastic waist. XL C: 46-48" / W: Pants available to fit all sizes. Includes: Lace front shirt & pants. Includes: Shirt, Vest & Pants. 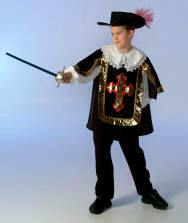 Includes: Two-tone jacket with attached contrasting sleeves, hat, pants & belt sash. leg cuffs & elastic fit waistband. Includes: Pants, shirt, hat, and belt. 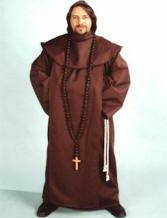 Includes: Tan velour tunic, red velour pants & white ruffled shirt. Includes: Black Shirt accented w/gold trim & collar & matching pants. Boots & Headpiece not included. 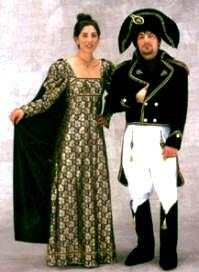 Includes: Black Dress w/ornate gold trim accents & matching gold metalic hat. 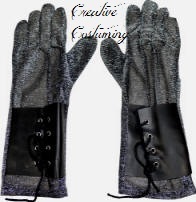 Includes: Glittery silver mesh gloves w/faux leather lace up wrist band/cuffs. Over the knee fitted socks. 99% cotton & 1% elastic. Footed. Size: Total length is 35". Top to heel length is 25". 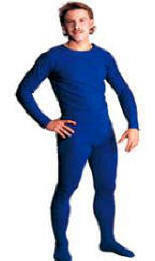 Size: Chest size 38, 40, 44, 46, 50. 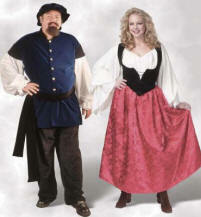 Includes: Poly-poplin tunic and cape, poly-cotton collar & cuffs, matching pants, waist sash & vinyl boot tops w/poly-cotton cuffs. 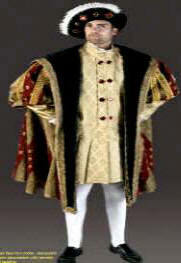 Feel truly regal in our brocade doublet. Lacing in the front and the back sides assures a proper fit. Removable sleeves tie on for comfort in all seasons. Polyester brocade with cotton/poly lining. 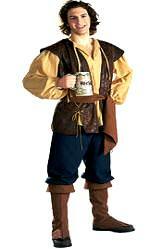 Circa middle ages to the present day. 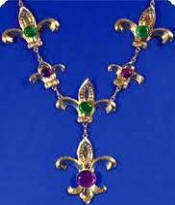 This chain of office is made from metal plates, bearing a filgree design, set with assorted color glass gems. 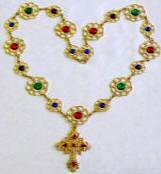 The pendant is an ornate renaissance cross set with glass gems to simulate rubies. gold backing & gold chain. 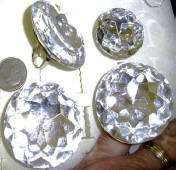 For, size comparison, notice the quarter on the left & that the ring in top right corner is the same as FFR373 shown below. Includes: Jumpsuit, collar and hat.